In 2011, my husband and I celebrated our 25th anniversary by traveling to Germany, Switzerland, and Italy. Thousands of pictures later (taken with my little Canon PowerShot SX210 IS), we returned home with many happy memories and much more importantly, a deeper love and appreciation for each other. Our visit to the Pantheon in Rome was a very memorable one. Built in 126 AD, the Pantheon is an architectural marvel. To step inside and to look at the coffered ceiling inside the dome and the perfectly round oculus which is open to the sky, brought a sense of balance to the spirit. Today, the Pantheon is actually a Roman Catholic church, St. Mary and all the Martyrs. 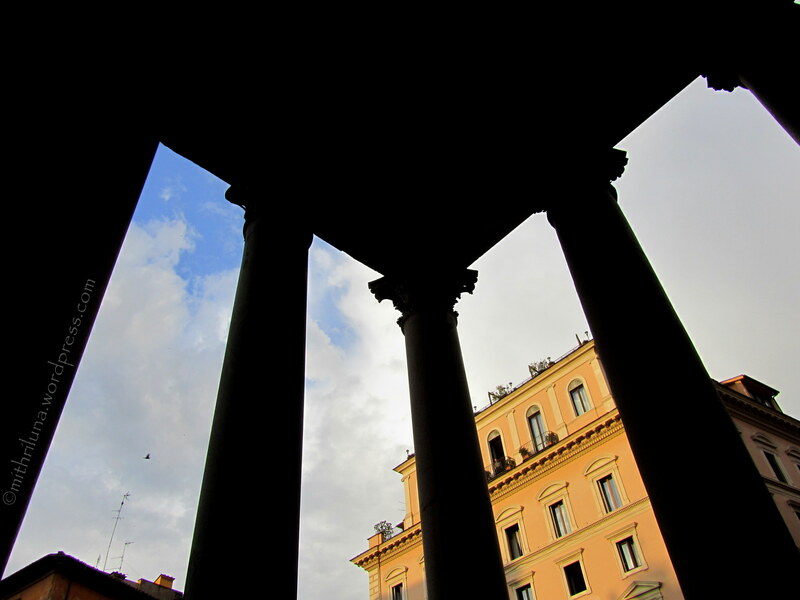 One of the best things to do in Rome is to find a spot to sit, particularly in the portico of a 2,000 year old building, to marvel at the ancient columns, and to imagine what life was like way back in the second century. For more about the Pantheon, Huffington Post recently wrote about the Living History Show video series whose first video features the Pantheon. A terrific post that brought back some amazing memories of the Austria and Italy trip my wife and I made back in 2006. Being a massive history and architecture fan, I was completely blown away by everything I saw on that trip, but the Pantheon ranked near the very top of my list of the most amazing things I’ve ever seen. I am completely baffled at how these structures were built in the time they were. It is funny though, you definitely do seem to feel a physical change when you walk into this place. After traveling around the world, Rome is my favorite city by far. I am not a city person but I fell in love with Rome. 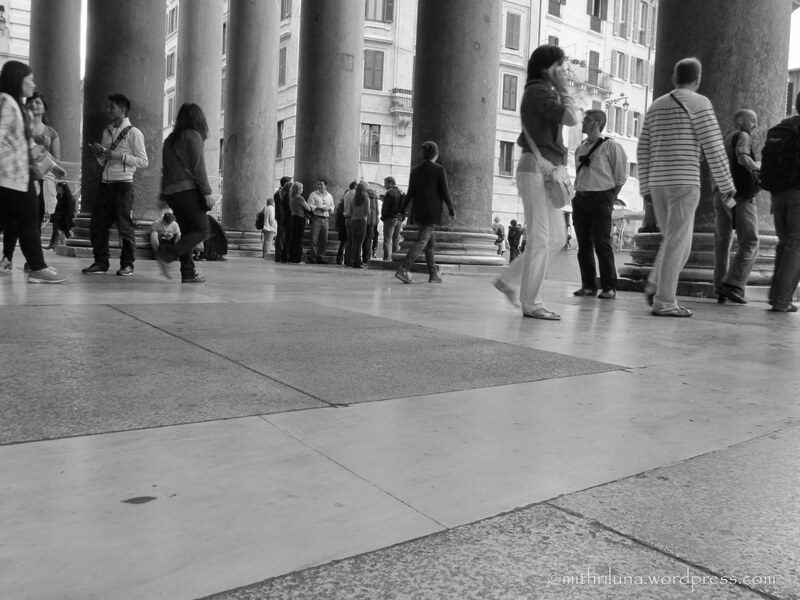 And the Pantheon is one of my favorite places to visit within the city. IN-credible. Thanks for your comment! Have a good Wednesday! Majestic building! It’s an amazing architecture. Great photos, Luna! Thank you Amy! Have a good Wednesday! Beautiful, beautiful. I love that you did them in black and white… I do like the perspective of the last shot though… you have a great ‘eye’. Belated happy anniversary… you definitely have wonderful memories of your 25th. Thank you so much Joan. My oldest daughter saw me putting this post together and she also commented on me having a great eye even when I am using my little camera. She is a part-time amateur videographer and is also a photographer. Thank you so much for the comments and compliments! Wonderful pictures! My husband and I were blessed with an opportunity to visit Rome and the Pantheon really left a great impression on me. Your pictures inspires me to want to go back again! Thank you! Yes, I want to go back there again too. Now I understand why people visit Rome more than once.